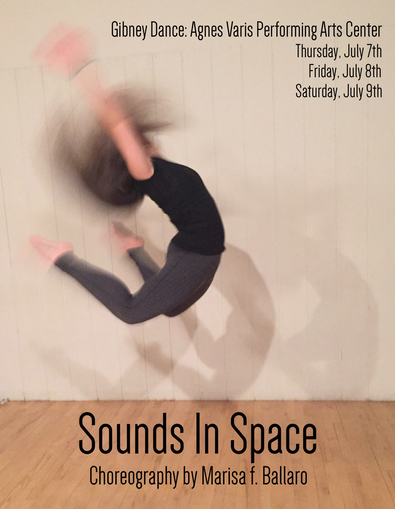 Tickets on sale for Sounds In Space! Tickets are now on sale for Sounds In Space! Ballaro Dance presents an evening of short modern dance works to the music of composer David Schanzer. The evening includes pieces that are both high energy and rhythmic in nature, as well as emotional pieces which tell stories and share the journey of their characters. Dancers: Emilee Ballaro, Lacey Birch, Bridget Cronin, Elliott Keller, Ashley Peters, Carina Sccichitano, and Sasha Smith; Live music by David Schanzer. Join us in the lovely Agnes Varis Performing Arts Center at Gibney Dance in July. This show is NOT to be missed!